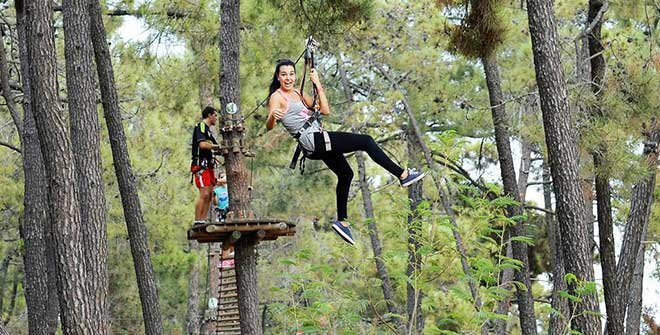 In Elviria, less than 2 minutes away from Chiringuito El Laurel, you can find the biggest adventure park of Andalusia (and the only one in Spain located near the sea). If you want to feel your Marbella experience is complete, you can ask our staff for more information about this park. 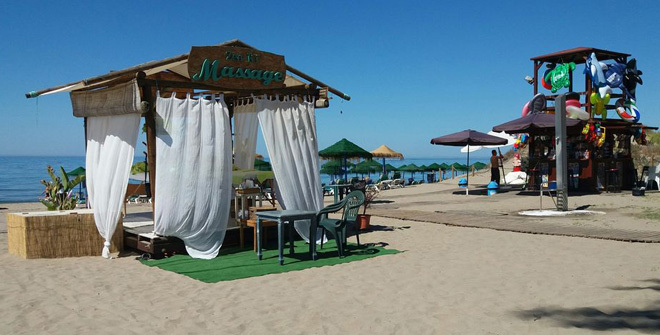 Right next to the Chiringuito El Laurel you can find one of the authorized massage cabins that perform their work at our coasts. These kind of services add up to your vacation experience to make it perfect, letting you get a massage almost without moving from the sun bed on which you're resting today. Your day at the beach can be awesome if you combine a tasty paella at El Laurel with a back massage to help you digest it! Near Elviria, in Marbella, you can find some of the most selected golf courses in Málaga. Within a couple of minutes from our Chiringuito, El Laurel, you can get to Santa María Golf Club: an 18 holes course in which you can enjoy a permanent view of the sea while you swing. Plus, it's surrounded by all kind of trees that will make you fall in love with the place. Book a table at El Laurel and finish your day with a golfing evening! The urbanization Jardines de las Golondrinas holiday apartment rentals covers 130 acres of pinewoods and mature sub-tropical gardens in an average of 150 meters from the sandy beach. Where? Just besides our restaurant, El Laurel. Its awesome pool bar it's opened every day during the season, offering snacks & drinks in a wonderful space: Elviria. If you're looking for housing, in this urbanization you can find one, two and three bedrooms appartments, so you can choose the one that best fits your needs! A few steps away from Chiringuito El Laurel you can find Romana Fitness Centre. Right at the shoreline, Romana Fitness Centre is the perfect place to do some exercise if you are on the area. With professionals ready to help you right when you need it, new facilities and best qualities. 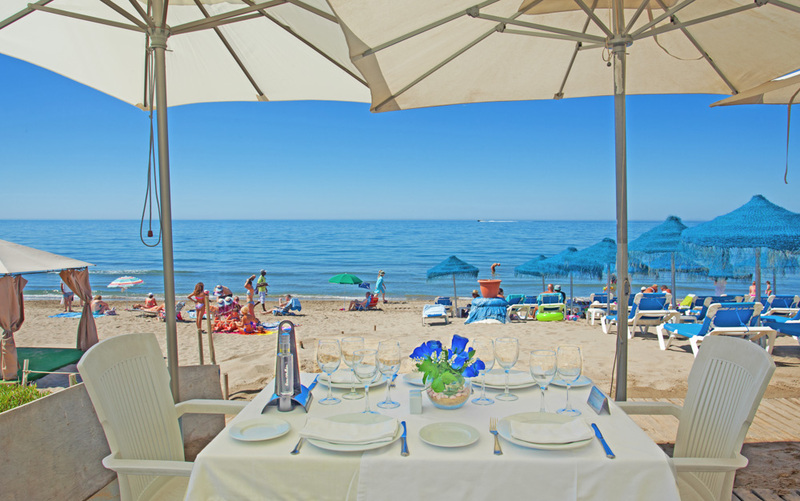 El Laurel's beach is, for many people, the best beach of Marbella. 10 kilometres away from the city centre mean that you can get your spot to lay down and sunbathe even in the summertime. It's a shallow water beach, so you can choose between a nice walk on the shoreline or a refreshing dip. Its golden, thin, sand, is cleaned regularly by our staff, allowing you to enjoy a bright beach whenever you want to do it. At Chiringuito El Laurel we have over 70 sunbeds ready to welcome you by the time you fancy some extra comfort while you sunbathe. If you're coming from Marbella: Take Elviria's exit from N340 (A7). Take the first exit on the first roundabout (south direction) and the second exit on the second one (south, too). Keep going through the Avenida Jardines de la Golondrina and you'll find us at the end of it. If coming from Málaga: Take Elviria's exit from N340 (A7) and the fifth exit at the roundabout, to the bridge crossing the highway. Once crossed, directions are the same than from Marbella.